WASHINGTON -- Unemployment insurance may save your life. 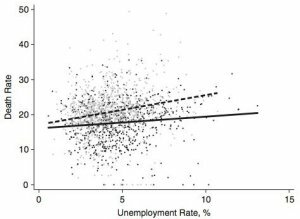 Researchers have long understood that higher unemployment rates correlate to higher suicide rates, but a new study in the American Journal of Epidemiology is the first to suggest that more generous unemployment benefits can mean fewer suicides. "If the unemployment rate increases, having better benefits is going to buffer the effect," the study's lead author, Jon Cylus, told HuffPost in an interview. Suicide rates have generally followed the business cycle, rising when the economy sinks. Though experts say suicide is complicated and never attributable to a single factor, such as job loss, major economic problems can lead to suicide attempts among people who are already vulnerable for other reasons. One recent study suggested the Great Recession precipitated more than 10,000 suicides in Europe and North America. Cylus, a research fellow at the London School of Economics, looked at variations in benefit amounts in U.S. states from 1968 to 2008. The U.S. unemployment compensation system is overseen by the federal government, but states administer their own programs and have leeway to determine how much money laid-off workers can get and for how long. "Higher unemployment rates predicted higher suicide rates, but this association was steeper when unemployment benefits were low," wrote Cylus and study co-authors M. Maria Glymour and Mauricio Avendano. They suggest that financial distress, societal stigma and social isolation are among the plausible explanations for the link between unemployment and suicide. "We found that larger maximum cash unemployment benefits mitigate the impact of increasing unemployment on suicide rates," the paper says. "This interaction between unemployment rates and benefit generosity suggests that the increase in suicides during recessions may partially be due to income loss among the unemployed or fear of income loss among other groups during periods of economic uncertainty." The solid line in this chart from the paper shows the correlation between the unemployment rate and the annual number of suicide deaths per 100,000 workers in states with high benefit levels. The dotted line shows the correlation in states with low benefit levels. The period studied in Cylus' paper pre-dates the Great Recession, which started at the end of 2007. Congress responded by providing an unprecedented number of additional weeks of benefits for the long-term unemployed, but lawmakers allowed those extra weeks to expire in December 2013 despite persistent long-term joblessness. Democrats have said it's cruel to leave the jobless hanging, but Republicans have been unwilling to go along with another extension. Cylus said suicide is a blunt measurement of the potential mental health benefits of more generous unemployment insurance policies, which, he noted, are not designed specifically to prevent suicides. Previous research has linked unemployment to worse physical and mental health. "If there's a small effect on suicides, there's probably a substantial effect across the board," he said.